September 18, 1924 – The president of the Illinois Society of Architects, Charles E. Fox, proposes in the monthly bulletin of the society “a half-mile long, permanent stone bridge, 160 feet high, over the mouth of the Chicago river”. [Chicago Daily Tribune, September 19, 1924] The massive bridge would take the place of the lift bridge or the tunnel, plans that are under consideration as ways to connect Grant Park and the south side of the city with the north side of the river and Lake Shore Drive. Says Fox, “It’s a reasonably safe bet that if the proposed tunnel is ever constructed, it’ll stand for a generation or two as a monument to bad judgment and then’ll be filled up … The war department already has shown its hand by refusing to have a lift bridge east of Michigan avenue … On the north a design of approach could be incorporated into the architectural treatment of the Municipal pier. The bridge itself would be the monumental hub of the city. A view from the crown of the arch would give to the passing stranger, as well as to the citizen of Chicago a magnificent birdseye view of Grant park and the lake shore both north and south.” Imagine today what a difference it would make to have a massive stone bridge straight out of New York City plunked down at the entrance to the river … things would look a lot different. September 18, 1925 – Alonzo C. Mather pays $500,000 or $7,692 a square foot for 65 feet of frontage on Wacker Drive, adding this property, owned by the Chicago Title & Trust Company, to Michigan Avenue property he already owns east of the Wacker Drive lot. Born in Fairfield, New York in 1848, Mather came to Chicago in 1875, where he started a wholesale business. At some point he found a way to wealth – by developing a new kind of railroad stock car that reduced the loss of life stock while in transit through the provision of feed and water. 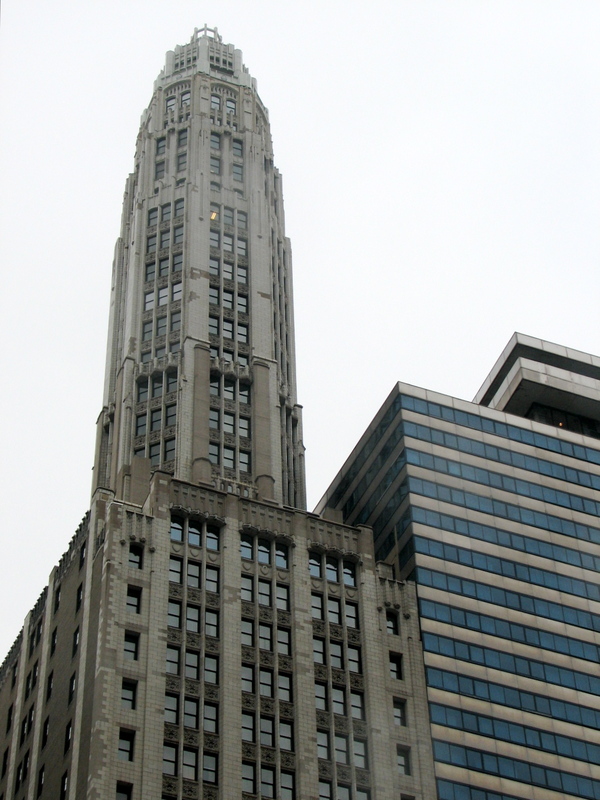 The Herbert Hugh Riddle design for Mather Tower at 75 East Wacker Drive provided the headquarters for the Mather Stock Car Company when it opened in 1929. The existing piece of property that Mather owned on Michigan Avenue was meant for another similar tower that would be connected its partner on Wacker Drive by a ground floor arcade. The economic catastrophe of the Great Depression ended the plan for the second tower.